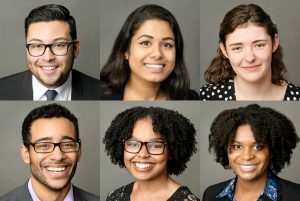 Macaulay Honors College congratulates sophomores Marco Costanza (College of Staten Island), Maisha Kamal (Brooklyn College), Kaitlin McDermott (Queens College), Saif Zihiri (Hunter College) and freshmen Alexandra Shoneyin (John Jay College) and Victoria Smith (Lehman College) on winning the Jeannette K. Watson Fellowship. The Watson Fellowship is a three-year program that provides summer internships with leading non-profit, for-profit and government organizations, culminating in an internship overseas. Fellows experience the expectations and challenges of professional-level work, while expanding their personal, cultural and professional horizons. Marco Costanza is pursuing a dual degree in Psychology and Spanish. In doing so, he aspires to integrate knowledge of human behavior, cognition, cross cultural perspective, and language in medicine to better serve the diversely underserved populations of New York City. With the Watson fellowship, he hopes to intern in either Ecuador or Spain, as it will add to his understanding of the intersection of race and cultural ethnicity in healthcare. Marco is also a 2017 William R. Kenan Scholar. Maisha Kamal is a Business Economics and English major, with a strong interest in public policy and human rights. She aspires to become a lawyer someday, but hopes to experiment with different fields and learn new skills, looking forward to the transformative experiences that await her as a fellow. “I would not have been able to get this opportunity had it not been for the unwavering support of the Macaulay community, and I am excited to grow under the guidance of the Watson foundation and in the company of my fellow cohorts over the next three years,” said Maisha. Saif Zihiri is a Political Science major with a certificate in Public Policy and Human Rights, with the overarching desire to go into the human rights field as an advocate for both people who need it but also to work on policy reform regarding human rights violations. He currently interns at the Global Centre for the Responsibility to Protect, and hopes to work with similar-minded organizations with the help of the Watson fellowship. Victoria Smith is technically undeclared, but interested in psychology, Africana studies, and music. An active member of the Macaulay community, Victoria serves as a student ambassador, as well as a member of Humans of Macaulay. “I was ecstatic to learn that I had received this fellowship, [as] I have been working towards this for 6 months. To see all of this hard work come together was an incredible feeling. It made all of this worth it!” she said.